Plunking sensitive items in a box and having them rumble around in the back of a truck can wreak havoc, leaving them damaged or even irreparably broken. Hiring a professional moving company like On the Move to pack and move your household good ensures your valued possessions will be packed up in a manner that will best protect them in transit. When moving on your own, the risk of damaged items is pretty high. Here are 3 of the most often damaged types of items, and what you should do to avoid damage if you choose to pack yourself. Speakers, computers, and flat-screen TVs are highly sensitive pieces of equipment that, if not well packed, are almost guaranteed to sustain damage. The damage may not be evident on the surface, but the electronics inside can become loose and cause the item to not work correctly. To prevent damage, repack what you can in original boxes. Otherwise, be sure that your electronics are well-padded and secure. Label these boxes well. When moving, it’s inevitable that some furniture is going to sustain damage. Broken chair or dresser legs, scratches to wood surfaces, and dinged edges are extremely common. Disassemble furniture as much as you can, removing feet and packing them in labeled bags attached to the piece or packed in a box. Make use of blankets and any other padding to protect surfaces. Dishes and plates, glasses, stemware, and even appliances are susceptible to moving damage, especially when most DIY-ers choose to pack using newspaper, plastic grocery bags, and towels. 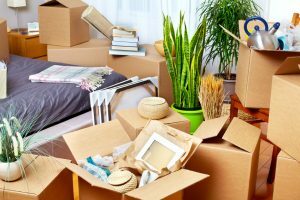 Your best bet is to pack using specialized boxes with partitions and dividers in place designed to keep these items safe. Adding extra cushioning between items is always a good idea. Your best bet for keeping fragile items safe is to hire a professional moving company. On the Move serves Middle Tennessee with both short and long distance moving services. Our moving experts know all the right packing methods to ensure your items arrive at your new home in the same condition they left your old place. Contact us today for a quote!